In granulocytes, platelet-activating factor (PAF) shares many of its biological effects with other chemotactic factors, such as FMLP, complement fragments, and lipid mediators. Two unique effects are that PAF is relatively resistant to pertussis toxin (PTX) and that PAF activates the inflammatory functions of eosinophils more strongly than it activates those of neutrophils. To investigate the molecular mechanisms of the responses of eosinophils to PAF, we analyzed superoxide anion production by a chemiluminescence method that provides real-time kinetic data for the cellular responses. We found that PAF induced bimodal superoxide anion production in human eosinophils, consisting of an intense, but transient, first phase and a larger and sustained second phase. In contrast, PAF induced essentially a transient unimodal response in human neutrophils. The two phases of eosinophil response were mediated by distinct cellular mechanisms: the second phase was highly dependent on cellular adhesion and β2 integrins, but the first phase was independent of both adhesion and β2 integrins. 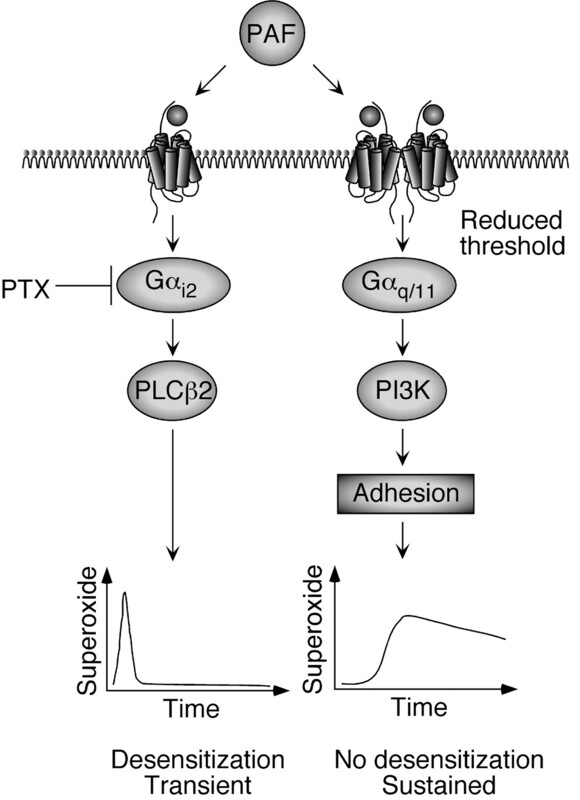 The upstream signaling mechanisms were also different: the second phase was mediated by PTX-resistant G-protein(s) and through activation of phosphatidylinositol 3-kinase, while the first phase was mediated by PTX-sensitive G-protein(s). Furthermore, the second-phase response was ∼100-fold more resistant to inhibition by a competitive PAF receptor antagonist than the first phase. Thus, eosinophils and neutrophils react differently to PAF, and PAF activates two separate and distinct effector pathways in human eosinophils. These two activation pathways may explain the eosinophils’ strong and diverse biological responses to PAF. Platelet-activating factor (PAF)3 is a potent phospholipid mediator with several biological actions (reviewed in Refs. 1, 2, 3); a specific receptor for PAF has been identified in a number of tissues and cell types, including eosinophils (2, 3, 4). Accumulating evidence suggests that PAF is one of the most versatile agonists for eosinophils. For example, PAF is an effective chemotactic factor for human eosinophils in vitro (5, 6) and promotes eosinophil adherence to vascular endothelial cells through a β2 integrin, CD11b/CD18 (Mac-1) (7). Furthermore, in eosinophils PAF induces various effector functions, such as degranulation (8, 9), production of superoxide anion (10, 11) and leukotriene C4 (12, 13), and formation of lipid bodies (14). Interestingly, PAF is generated by human eosinophils themselves and amplifies their effector functions in an autocrine manner (15). On the other hand, the role of PAF in the pathophysiology of eosinophil-associated human diseases is still controversial. Epidemiological studies found that the lack of PAF acetylhydrolase, which catalyzes the hydrolysis of PAF, is associated with atopy and severe asthma (16, 17). However, several clinical studies in patients with asthma found no significant efficacy of PAF receptor antagonists (18). Therefore, further studies are needed to elucidate the role of PAF in human disease. In granulocytes, PAF shares many activities with other chemotactic factors, such as FMLP, C5a, and leukotriene B4 (LTB4). For example, in both eosinophils and neutrophils, PAF as well as other chemotactic factors operate through the intermediary of heterotrimeric G proteins (G proteins), stimulate increases in the intracellular Ca2+ concentration ([Ca2+]i), activate protein kinases, and induce actin filament polymerization and chemotaxis (reviewed in Refs. 2, 3 , and 19). However, several studies also highlight distinct differences in the effects of PAF on non-motility functions of eosinophils and neutrophils. For example, when stimulated with PAF, eosinophils produce ≥3 times more superoxide anion than neutrophils (11). In another study PAF alone induced superoxide anion production from eosinophils, but not from neutrophils, while PAF primed both eosinophils and neutrophils for superoxide anion production stimulated with zymosan or FMLP (20). Studies of intracellular signaling also showed that PAF activates the 42- and 44-kDa mitogen-activated protein kinases (MAPK), ERK1 and ERK2, in human eosinophils (21) while PAF did not activate these MAPK in human neutrophils (22). Thus, there are probably quantitative and qualitative differences in cellular responses to PAF between eosinophils and neutrophils. How might PAF preferentially activate eosinophils compared with neutrophils? PAF causes similar increases in [Ca2+]i in both neutrophils and eosinophils; the increases in [Ca2+]i in neutrophils occurred with a lower concentration of PAF than that required for eosinophils (11). Therefore, the calcium responses are an unlikely solution. 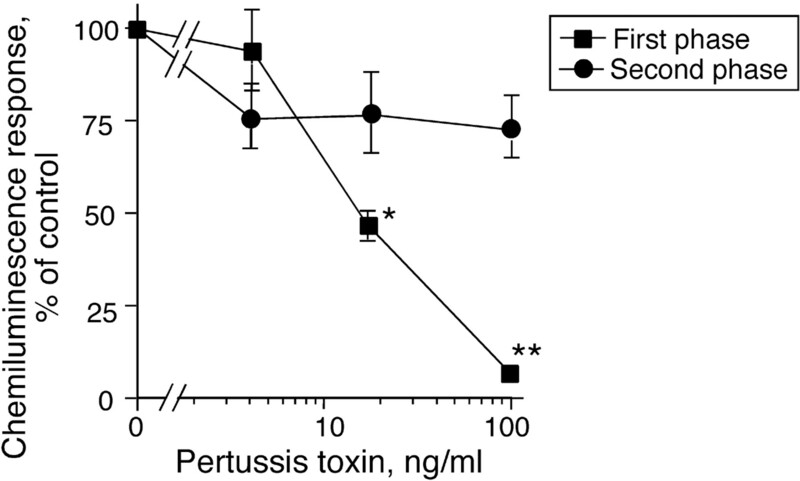 G proteins that are involved in cellular responses to chemotactic factors are often sensitive to an ADP-ribosylating agent, pertussis toxin (PTX). Indeed, the neutrophil’s response to FMLP is a classic example of the involvement of a PTX-sensitive G protein (23). Similarly, in eosinophils, cellular aggregation, increases in [Ca2+]i, and degranulation stimulated with C5a, LTB4, and FMLP are inhibited by PTX (24, 25). However, the nature of G proteins involved in the PAF response is more complex. For example, the [Ca2+]i response and MAPK activation of human eosinophils are inhibited by PTX (21, 26, 27). In contrast, in human neutrophils the increases in [Ca2+]i and activation of Ral are not inhibited by PTX (28). Furthermore, recent studies using genetically engineered cells reveal a relative resistance to PTX of the PAF receptor compared with receptors for LTB4 or FMLP (29). To better understand the molecular mechanisms of human eosinophil and neutrophil responses to PAF, we used a novel approach, namely detection of superoxide anion production by the chemiluminescence method (30). This method correlates linearly with the superoxide anion production detected by the conventional cytochrome c reduction method (31, 32, 33). Furthermore, the chemiluminescence method is ∼100 times more sensitive than the cytochrome c method, and it enables a real-time kinetic, rather than cumulative, analysis of superoxide anion production (31, 32, 33). We found that PAF activates two distinct effector pathways coupled to the PAF receptor in human eosinophils, one linked to PTX-sensitive G-protein(s) and the other through activation of PTX-resistant G protein(s), phosphatidylinositol 3-kinase (PI3K) and cellular adhesion. This use of two G proteins by the eosinophil PAF receptor may explain the strong and diverse biological responses of human eosinophils to PAF. 2-Methyl-6-(p-methoxyphenyl)-3,7-dihydroimidazo-[1,2-a]pyrazin-3-one (MCLA) was purchased from Tokyo Kasei Chemical Co. (Tokyo, Japan). The compound was dissolved in double-distilled water. The concentration of MCLA was based on ε430 = 9600 M−1 cm−1 as previously described (33, 34). PAF (1-O-hexadecyl-2-acetyl-sn-glycero-3-phosphorylcholine) and CV6209 were purchased from Bachem Feinchemikalien (Budendorf, Switzerland), dissolved in absolute ethanol to 40 mM, and stored at −20°C. Genistein, herbimycin A, wortmannin, and LY294002 were obtained from Calbiochem (Los Angeles, CA). PMA and superoxide dismutase (SOD) were purchased from Sigma-Aldrich (St. Louis, MO). Stock solutions of genistein (50 mg/ml), herbimycin A (5 mg/ml), wortmannin (1 mM), LY294002 (10 mM), or PMA (5 mg/ml) were dissolved in DMSO, and aliquots were stored at −20°C. The solutions were diluted in reaction medium immediately before use. Preliminary studies demonstrated that the final concentrations of DMSO used did not affect eosinophil viability or stimulus-dependent superoxide production. Anti-CD18 mAb was purchased from BD Biosciences (San Jose, CA); this Ab possesses blocking activities for cell adhesion (35). Irrelevant isotype-matched control Ig, mouse myeloma IgG1, was purchased from Cappel-Organon Teknika Co. (Durham, NC). Eosinophils and neutrophils were isolated from heparinized peripheral blood of normal volunteers. Eosinophil isolation was performed as described previously using a MACS (BD Biosciences) (36) with minor modifications. Briefly, blood diluted with an equal volume of PBS was overlaid on Histopaque solution (density, 1.083 g/ml; Sigma-Aldrich) and centrifuged at 700 × g for 30 min at 4°C. The supernatant and the mononuclear cells at the interface were carefully removed. Erythrocytes were lysed by water lysis. Isolated granulocytes were washed with PIPES buffer (25 mM PIPES, 50 mM NaCl, 5 mM KCl, 25 mM NaOH, and 5.4 mM glucose, pH 7.4) with 1% FBS (JRH Biosciences, Lenexa, KS), and an approximately equal volume of anti-CD16 Ab conjugated with magnetic particles (Miltenyi Biotec, Auburn, CA) was added to the pellet. After incubation on ice, cells were loaded onto the separation column in the MACS strong magnetic field, and eosinophils were eluted with PIPES buffer with 1% FBS. Neutrophils were isolated by using a gradient material, 1-Step Polymorphoprep (Accurate Chemical & Scientific Corp., Westbury, NY), following the procedure recommended by the manufacturer. By Randolph’s stain the purity of eosinophil and neutrophil preparations was >98%. The eosinophils or neutrophils were washed in PIPES buffer with 1% FBS and suspended in reaction medium. The superoxide anion production was measured by a cytochrome c reduction method in 96-well tissue culture plates blocked with human serum albumin (Sigma-Aldrich) as described previously (37). Briefly, freshly isolated cells were washed and resuspended in HBSS with 10 mM HEPES and 100 μM cytochrome c at 5 × 105 cells/ml. One hundred microliters of cell suspension were dispensed into the wells, followed by 100 μl of 1 μM PAF or 1 ng/ml PMA. Immediately after addition of stimuli, the reaction wells were measured for OD550 in a microplate Autoreader (Thermomax; Molecular Devices, Menlo Park, CA), followed by repeated readings. Between readings the plate was incubated at 37°C. Superoxide anion production was calculated with ε550 = 21.1 × 103 cm−1 M−1 for reduced cytochrome c and was expressed as nanomoles of superoxide produced per 105 cells. In selected experiments cells were preincubated with serial dilutions of wortmannin or LY294002 for 5 min before addition of stimuli. To address the real-time production of superoxide anion by eosinophils or neutrophils stimulated with PAF, we used a chemiluminescence method (33, 34). Briefly, the polyethylene reaction tubes (Aloka, Tokyo, Japan) were blocked with 300 μl of 2.5% human serum albumin dissolved in PBS overnight at 4°C to avoid nonspecific activation. After blocking, the tubes were washed three times with PBS. Eosinophils or neutrophils were resuspended in HBSS with 3 μM MCLA at 1 × 106 cells/ml. Aliquots (250 μl) of cell suspension were added to the reaction tubes, and background chemiluminescence was recorded for 5 min with a luminescence reader (BLR-102; Aloka) maintained at 37°C. 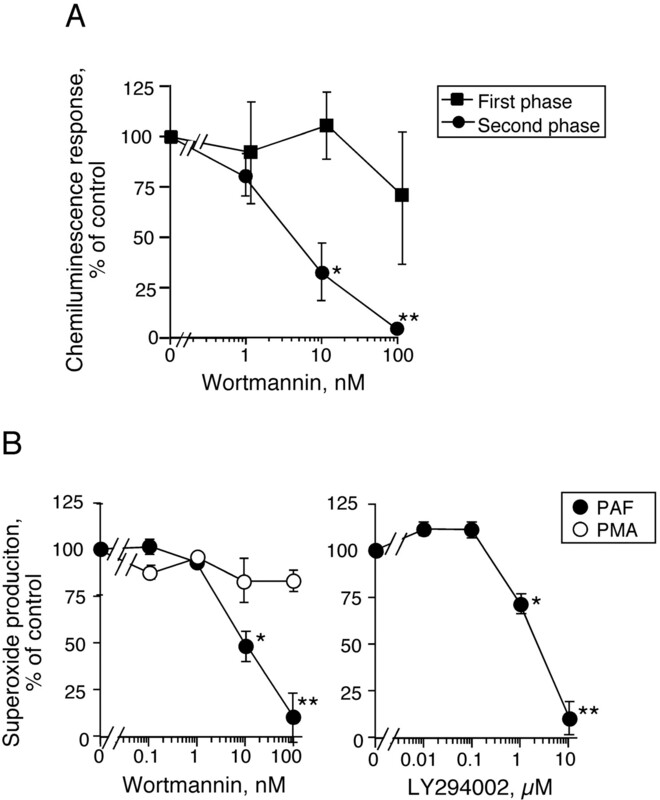 PAF was added, and the MCLA-dependent chemiluminescence response was recorded for up to 30 min. These chemiluminescence responses of eosinophils and neutrophils were completely inhibited by 0.5 μM SOD. Production of superoxide anion was expressed as maximum chemiluminescence intensity (cpm) or as integrated chemiluminescence intensity for the first 25 min (counts per 25 min) as previously reported (33, 34). In some experiments when the effect of maintaining cells in suspension on superoxide anion production was studied, the reaction tube in the luminescence reader was rotated. To examine the effect of anti-CD18 Ab, the cells were preincubated with the Ab or control mouse IgG1 for 30 min at 4°C before addition of stimuli. When the effects of PTX or other inhibitors were studied, the cells were preincubated with PTX or herbimycin A for 2 h at 4°C, with genistein for 1 h at 4°C, or with CV6209, wortmannin, or LY294002 for 5 min at 37°C before stimulation. Raw values or normalized values from the indicated number of independent trials were averaged and expressed as the mean ± SEM. The statistical significance of the difference between various treatment groups was assessed with paired or unpaired Student’s t test. We previously reported that PAF potently induces adhesion, superoxide anion production, and degranulation of human eosinophils (37, 38). To compare the responses of human eosinophils and human neutrophils to PAF, we examined superoxide anion production with cytochrome c. As shown in Fig. 1⇓A, 1 μM PAF potently induced superoxide anion production from eosinophils; the response was ∼60% of a positive control, 1 ng/ml PMA. In contrast, neutrophils produced minimal superoxide anion in response to PAF, while they produced amounts of superoxide anion comparable to eosinophils when stimulated with PMA (Fig. 1⇓A). A summary of three experiments (Fig. 1⇓B) shows that when stimulated with PAF, eosinophils produce ∼7 times more superoxide anion compared with neutrophils (p < 0.05; n = 3). Superoxide anion production by human eosinophils and neutrophils stimulated with PAF or PMA as examined by cytochrome c reduction. Isolated eosinophils or neutrophils (5 × 105 cells/ml, 100 μl/well) were added to 96-well tissue culture wells and stimulated with medium alone, 1 μM PAF, or 1 ng/ml PMA. The OD was immediately measured at 550 nm, followed by repeated readings. A, The kinetics of superoxide anion production are shown using eosinophils and neutrophils from the same donor. B, Summary of the results of three separate donors. Superoxide anion production was calculated after 120 min of incubation. Data are presented as the mean ± SEM. To elucidate the mechanisms for these different responses of eosinophils and neutrophils to PAF, we used a sensitive chemiluminescence method to monitor superoxide anion production. This chemiluminescence method provides real-time kinetic data for both rate (i.e., intensity) and amount (i.e., integrated chemiluminescence response for a certain period) of superoxide anion production (31, 32, 33). Fig. 2⇓ shows typical kinetic data. In human eosinophils (Fig. 2⇓A), PAF at 1 μM induced a bimodal superoxide anion production, consisting of an intense transient phase and a prolonged phase, lasting ∼20 s and for at least 25 min, respectively. The integrated (area under the) curve indicates that the second phase accounts for ∼97% of the total superoxide anion produced by eosinophils during the first 25 min. In contrast, neutrophils (Fig. 2⇓B) showed virtually unimodal superoxide anion production, consisting of a sharp and transient peak. Neutrophils also showed a smaller and shorter (<5 min) second phase, but its magnitude and duration were clearly different from those of the eosinophils’ second phase. Furthermore, addition of SOD to the reactions completely blocked first and second phases of PAF-induced chemiluminescence in both eosinophils and neutrophils (data not shown), indicating specificity for this chemiluminescence response in superoxide anion production. 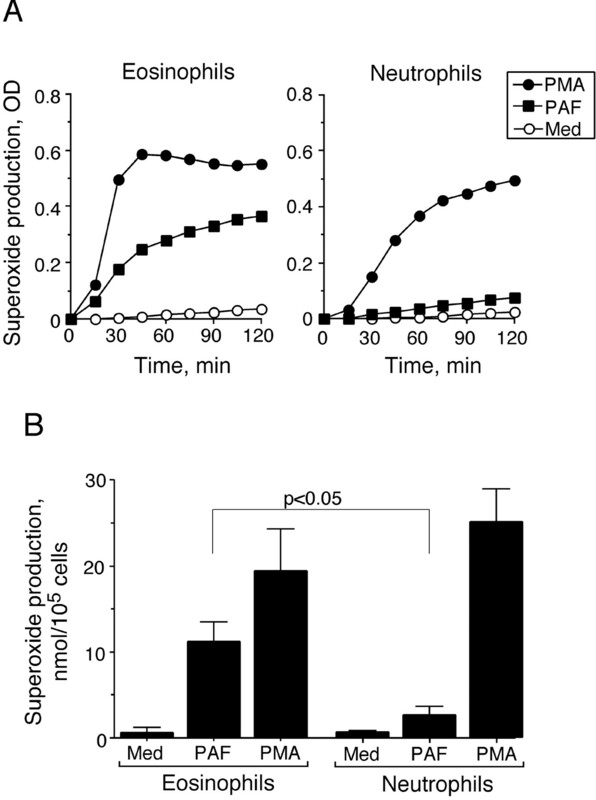 Kinetics of PAF-induced superoxide anion production in human eosinophils (A) and neutrophils (B) as examined by the chemiluminescence response. Isolated eosinophils or neutrophils (2.5 × 105 cells/sample) were preincubated for 5 min without stimulus, indicated concentrations of PAF were added (arrows), and MCLA-dependent chemiluminescence was measured as described in Materials and Methods. Real-time production of superoxide anion was measured as chemiluminescence intensity. Eosinophils show a bimodal response (a peak at 20–30 s and another peak at 3–10 min), and neutrophils show essentially a unimodal response. The chemiluminescence responses of eosinophils and neutrophils were quantitated and compared using cells isolated from the same donors; the experiments were repeated with four different donors. The first and second phases were quantitated as peak count and integrated count, respectively. As shown in Fig. 3⇓, left panel, both eosinophils and neutrophils showed concentration-dependent first-phase responses to PAF. At 1 μM PAF, the neutrophils’ first-phase response was significantly larger than that of eosinophils (p < 0.05; n = 4). In contrast, eosinophils, but not neutrophils, showed a concentration-dependent second-phase response to PAF (Fig. 3⇓, right panel). Indeed, the neutrophils’ second-phase response was ∼1/10th of the eosinophils’ second-phase response (p < 0.01; n = 4). Interestingly, in eosinophils, PAF, at 0.01 μM induced a distinct second-phase response, but no detectable first-phase response, suggesting that less PAF is required to activate the second-phase response in eosinophils. Summary of PAF-induced superoxide anion production in human eosinophils and neutrophils by the chemiluminescence method. Isolated eosinophils or neutrophils (2.5 × 105 cells/sample) were incubated in reaction tubes and stimulated with PAF. MCLA-dependent chemiluminescence was measured as described in Materials and Methods. The data were summarized as the mean ± SEM from four separate donors. Because the kinetics of superoxide anion production in the first and second phases differed considerably (see Fig. 2⇑), they were expressed and summarized differently. The first-phase response was expressed as the peak chemiluminescence response (peak cpm), and the second-phase response was expressed as the integrated chemiluminescence response after the first phase and ending at 25 min (total counts per 25 min). 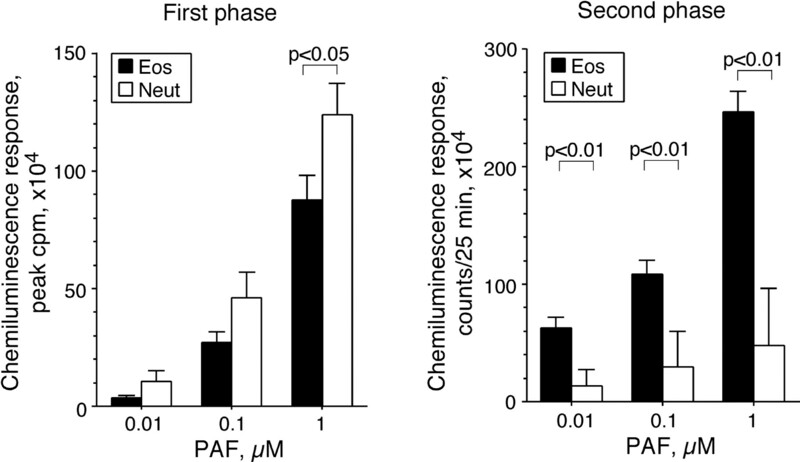 Thus, in contrast to neutrophils, eosinophils show a bimodal chemiluminescence response to PAF. We next investigated whether this bimodal response is a series of sequential events or two independent events. 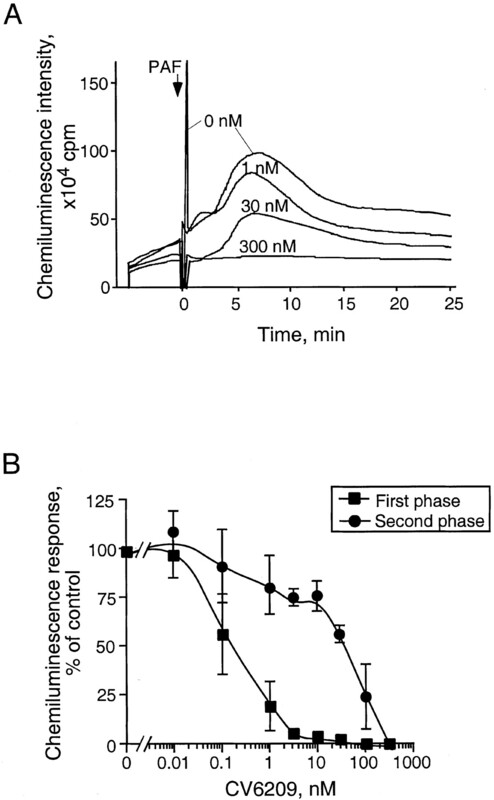 Because 0.01 μM PAF did not induce a first-phase response, but did induce a distinct second-phase response (see Fig. 3⇑), two independent events seemed likely. To address this issue more carefully, we took a different approach. We have previously shown that cellular adhesion to a large surface, such as plastic tubes and tissue culture wells, through β2 integrins plays a critical role in the function of eosinophils (37, 39, 40). As shown in Fig. 4⇓ when we prevented eosinophil adhesion by stirring continuously during the chemiluminescence response, the second-phase response was inhibited >75% (p < 0.01; n = 4). 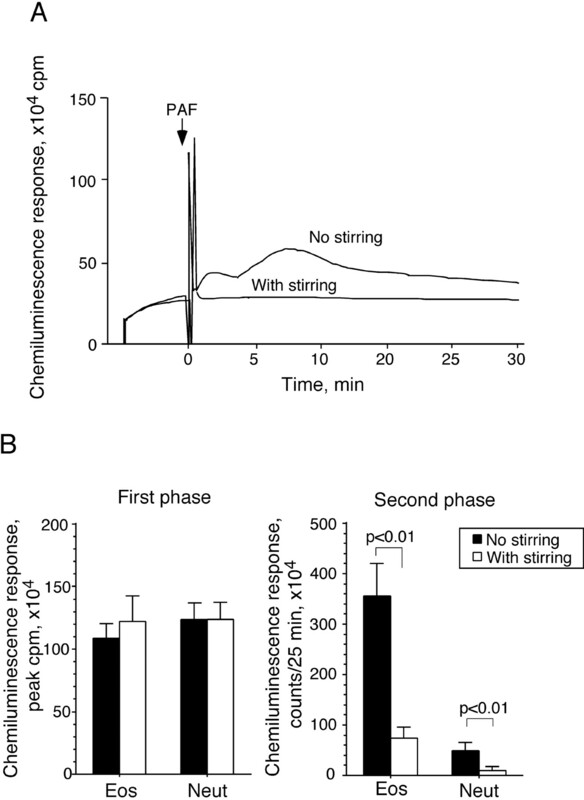 In contrast, the first-phase response of eosinophils was not affected by stirring. While the neutrophils’ second-phase response was smaller than that of the eosinophils, it was also inhibited by stirring (p < 0.01; n = 4). Similarly, Abs to β2 integrins inhibited the second-phase of eosinophil superoxide anion production stimulated with PAF; treatment with anti-CD18 mAb produced only 42 ± 8% of the response compared with control mouse IgG1 (mean ± SEM; n = 5; p < 0.05). In contrast, the first-phase eosinophil response was not inhibited by this Ab (126% of control mouse IgG1; mean; n = 5). Neither the first nor the second phase of the neutrophil chemiluminescence response to PAF was significantly inhibited by anti-CD18 mAb (113 and 82% of control mouse IgG1, respectively; mean; n = 3). Thus, in eosinophils the cellular mechanisms leading to superoxide anion production probably differ between the first- and second-phase responses to PAF; the first phase is independent of cellular adhesion, and the second phase is highly dependent on cellular adhesion mediated largely by β2 integrins. Effects of stirring during incubation on superoxide anion production by human eosinophils and neutrophils stimulated with PAF. Isolated eosinophils or neutrophils (2.5 × 105 cells/sample) were incubated in reaction tubes and stimulated with 1 μM PAF. The reaction tubes were either not stirred or were stirred consistently by rotating them during incubation to prevent cell adhesion to the tube. MCLA-dependent chemiluminescence was measured with a luminescence reader as described in Materials and Methods. A, The kinetics of the eosinophil chemiluminescence response were determined with or without stirring. B, Summary of the effects of stirring on first- and second-phase superoxide anion production by eosinophils and neutrophils are presented as the mean ± SEM of the peak chemiluminescence response (first-phase response) or the integrated chemiluminescence response (second-phase response) from four separate experiments. Receptors for chemotactic factors operate through the intermediary of G proteins, many of which are sensitive to an ADP ribosylation agent, PTX (2, 3, 19). The distinct cellular mechanisms involved in the bimodal eosinophil chemiluminescence response to PAF suggest that they are mediated by different G proteins. To characterize the G proteins coupled to PAF receptors in human eosinophils, we treated cells with PTX for 2 h and stimulated them with 1 μM PAF. As shown in Fig. 5⇓, the first-phase chemiluminescence response to PAF was inhibited by PTX in a concentration-dependent manner; PTX at 100 ng/ml abolished the first-phase response (p < 0.01; n = 4). In contrast, the second-phase response was not inhibited significantly by PTX up to 100 ng/ml. Thus, the first- and second-phase responses showed a marked difference in their sensitivity to PTX. Effects of PTX treatment on first- and second-phase superoxide anion production by human eosinophils stimulated with PAF. Isolated eosinophils (2.5 × 105 cells/sample) were added to reaction tubes and preincubated with PTX for 2 h at 4°C. Cells were then stimulated with 1 μM PAF, and MCLA-dependent chemiluminescence was measured. The first- and second-phase responses of superoxide anion production were quantitated as peak chemiluminescence and integrated chemiluminescence responses, respectively, and were normalized to the values without PTX. Data are expressed as the mean ± SEM from eight separate experiments. Superoxide anion production in the absence of PTX was: first phase, 314 ± 41 × 104 cpm; and second phase, 840 ± 80 × 104 counts/25 min (mean ± SEM). * and **, Statistically significant differences (p < 0.05 and p < 0.01, respectively) compared with the values without inhibitors. These observations suggested that eosinophils might possess two classes of PAF receptors, each coupled to different G proteins. We addressed this question with a Scatchard plot analysis using radiolabeled PAF under physiologic conditions (i.e., 37°C and in the presence of divalent cations). However, we were unable to interpret the results because radiolabeled PAF caused eosinophil activation, internalization of ligands, and/or cell death (data not shown). Therefore, we used a competitive PAF receptor antagonist, CV6209 (41). The cells were preincubated with serial dilutions of CV6209 for 10 min before addition of 1 μM PAF. As shown in Fig. 6⇓, A and B, first- and second-phase responses were abolished by 300 nM CV6209, suggesting that both phases are mediated by PAF receptors. However, the concentration-response curves (Fig. 6⇓B) showed a marked difference. For example, 1 nM CV6209 almost completely inhibited the first-phase chemiluminescence response; in contrast, 1 nM CV6209 only partially inhibited (∼25%) the second-phase response. The IC50 of CV6209 for first- and second-phase chemiluminescence responses were 0.2 and 30 nM, respectively (Fig. 6⇓B). This 150-fold difference between the two phases of the chemiluminescence response to a PAF receptor antagonist suggests that they are mediated by two different PAF receptors or by a single PAF receptor with two different biochemical characteristics. Effects of a competitive PAF receptor antagonist, CV6209, on superoxide anion production by human eosinophils stimulated with PAF. Isolated eosinophils (2.5 × 105 cells/sample) were added to reaction tubes and preincubated with CV6209 for 5 min at 37°C. Cells were then stimulated with 1 μM PAF, and MCLA-dependent chemiluminescence was measured. A, The kinetics of the eosinophil chemiluminescence response were determined in the presence or the absence of CV6209. B, The first- and second-phase responses of superoxide anion production with serial dilutions of CV6209 were quantitated as peak chemiluminescence and integrated chemiluminescence responses, respectively, and were normalized to the values without CV6209. Data are expressed as the mean ± SEM from three separate experiments. Superoxide anion production in the absence of CV6209 was: first phase, 116 ± 8 × 104 cpm; and second phase, 385 ± 95 × 104 counts/25 min (mean ± SEM). Because the second-phase chemiluminescence response of eosinophils to PAF was not mediated by classical PTX-sensitive G protein(s), we investigated other signaling pathways. In T cells the receptor for a chemotactic factor, RANTES, could be coupled to tyrosine kinase pathways independent of PTX-sensitive G proteins (42). Therefore, we examined tyrosine kinase inhibitors on the eosinophil’s response to PAF. As shown in Fig. 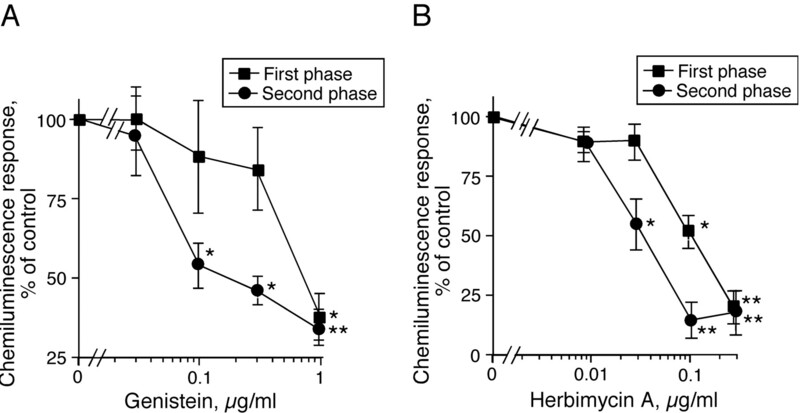 7⇓, A and B, both the first and second-phase chemiluminescence responses were inhibited by genistein and herbimycin A in a concentration-dependent manner, suggesting that tyrosine kinases play a key role in the eosinophils’ response to PAF. In contrast to PTX (Fig. 5⇑), the second-phase response was ∼3-fold more sensitive to these inhibitors than the first phase, suggesting that the second phase depends more on tyrosine kinases than does the first phase. Effects of tyrosine kinase inhibitors on first- and second-phase superoxide anion production by human eosinophils stimulated with PAF. Isolated eosinophils (2.5 × 105 cells/sample) were preincubated with genistein (A) for 1 h or herbimycin A (B) for 2 h at 4°C. Cells were then stimulated with 1 μM PAF, and MCLA-dependent chemiluminescence was measured. The first- and second-phase responses of superoxide anion production were quantitated as peak chemiluminescence and integrated chemiluminescence responses, respectively, and were normalized to the values without inhibitors. Data are expressed as the mean ± SEM from seven (genistein) or five (herbimycin A) separate experiments. The superoxide anion production in the absence of inhibitors was: first phase, 163 ± 39 cpm; and second phase, 500 ± 104 counts/25 min. ∗ and ∗∗, Statistically significant differences (p < 0.05 and p < 0.01, respectively) compared with the values without inhibitors. Some tyrosine kinases are probably common to both first and second phases of superoxide anion production, making the discrimination between the two phases difficult. To circumvent the problem, we studied a specific, upstream candidate molecule in eosinophil tyrosine kinase pathways. It has been shown that PAF activates eosinophil PI3K (21, 43). Therefore, we tested an inhibitor of PI3K, wortmannin, on the PAF-induced chemiluminescence response. As shown in Fig. 8⇓A, the first-phase response was not inhibited by ≤100 nM wortmannin; in contrast, the second phase was inhibited in a concentration-dependent manner and was abolished by 100 nM wortmannin (p < 0.01; n = 4). The IC50 value of wortmannin for the second phase was ∼4 nM, consistent with the reported IC50 value (5 nM) of wortmannin as a specific PI3K inhibitor (44). Thus, PI3K is probably involved in the second-, but not the first-phase response of eosinophils to PAF. Effects of inhibitors of PI3K on superoxide anion production by human eosinophils stimulated with PAF or PMA. A, The effects of wortmannin on eosinophil superoxide anion production were examined by chemiluminescence. Isolated eosinophils (2.5 × 105 cells/sample) were added to reaction tubes and preincubated with wortmannin for 5 min at 37°C. Cells were then stimulated with 1 μM PAF, and MCLA-dependent chemiluminescence was measured. The first- and second-phase responses of superoxide anion production were quantitated as peak chemiluminescence and integrated chemiluminescence responses, respectively, and were normalized to the values without inhibitors. Data are expressed as the mean ± SEM from four separate experiments. B, The effects of wortmannin and LY294002 on eosinophil superoxide anion production were examined by the cytochrome c reduction method. Isolated eosinophils (0.5 × 105 cells/sample) were added to wells of 96-well tissue culture plates and preincubated with the indicated concentrations of wortmannin or LY294002 for 5 min at 37°C. Cells were then stimulated with 1 μM PAF or 1 ng/ml PMA for 2 h, and the production of superoxide anion was measured by reduction of cytochrome c, as shown in Fig. 1⇑. Data were normalized to the values without inhibitors and are presented as the mean ± SEM from four independent experiments for each inhibitor. ∗ and ∗∗, Statistically significant differences (p < 0.05 and p < 0.01, respectively) compared with the values without inhibitors. To confirm the role of PI3K in the eosinophils’ response to PAF, we also examined the effects of PI3K inhibitors on superoxide anion production using a conventional cytochrome c reduction method (Fig. 1⇑). Fig. 8⇑B shows by this method that wortmannin inhibited superoxide anion production induced by PAF. The concentration-response curve and IC50 values of wortmannin were roughly comparable between the second phase by chemiluminescence (Fig. 8⇑A) and by cytochrome c reduction (Fig. 8⇑B), suggesting that inhibition of the second-phase response is sufficient to dampen the overall production of superoxide anion by eosinophils stimulated with PAF. In contrast, superoxide anion production induced by PMA was not affected by wortmannin. Finally, another potent and specific PI3K inhibitor, LY294002, inhibited PAF-induced superoxide anion production with a predicted IC50 value for the specific inhibition of PI3K (∼2 μM) (45). Thus, PI3K probably plays a critical role in eosinophil superoxide anion production stimulated by PAF. PAF stimulates two distinct pathways to induce superoxide anion production in human eosinophils. This novel conclusion is based on several observations. 1) PAF induced bimodal superoxide anion production in human eosinophils; in contrast, PAF induced essentially a unimodal superoxide anion production in human neutrophils. 2) Because the second phase was highly dependent on cellular adhesion and β2 integrins, but the first phase was independent of these mechanisms, the bimodal eosinophil superoxide anion production was mediated by distinctly different cellular mechanisms. 3) The second-phase response was detectable without any first-phase response, and the second-phase response was ∼100-fold more resistant to a competitive PAF receptor antagonist than the first phase. 4) The bimodal response showed pivotal sensitivity to pharmacological agents. The first-phase response was abolished by PTX treatment, but was not affected by a PI3K inhibitor; in contrast, the second phase was not affected by PTX, but was highly sensitive to a PI3K inhibitor. Thus, as illustrated in Fig. 9⇓, we propose a model of PAF-induced superoxide anion production in human eosinophils. Stimulation of eosinophils with PAF induces activation of PTX-sensitive G protein(s) that leads to the first-phase chemiluminescence response. Concomitantly, PAF induces activation of PTX-resistant G protein(s) and PI3K and causes adhesion-dependent activation of the cells, leading to the second-phase chemiluminescence response. Interestingly, RANTES also induced a bimodal calcium response in T cells (42). The initial phase was transient and mediated by PTX-sensitive G proteins, and the second phase was sustained and depended on tyrosine kinases, but was independent of PTX-sensitive G proteins. Thus, in a single cell type, receptor(s) for a chemotactic factor can be coupled to two distinct and separate effector pathways or calcium responses. A model of PAF-induced signaling and effector pathways in human eosinophils. Stimulation of eosinophils with PAF activates PTX-sensitive G protein(s), leading to activation of phospholipase Cβ (PLCβ) and the transient first-phase superoxide anion production. Concomitantly, PAF, probably mediated by PAF receptor dimers or a receptor with different biochemical characteristics, activates PTX-resistant G protein(s), leading to activation of PI3K, and causes the adhesion-dependent sustained second-phase superoxide anion production. Differences in the magnitudes of the cellular responses to PAF between human eosinophils and human neutrophils (11, 20, 21, 22) (Fig. 1⇑) were shown by parallel analyses of chemiluminescence responses ( Figs. 2–4⇑⇑⇑); these differences are probably qualitative and not simply quantitative. Eosinophils showed an adhesion- and β2 integrin-dependent second-phase response that was nearly absent in neutrophils. In contrast, an adhesion-independent, first-phase response was similar to or slightly more intense than that in neutrophils. Therefore, the adhesion-dependent second-phase response to PAF may be unique to eosinophils. 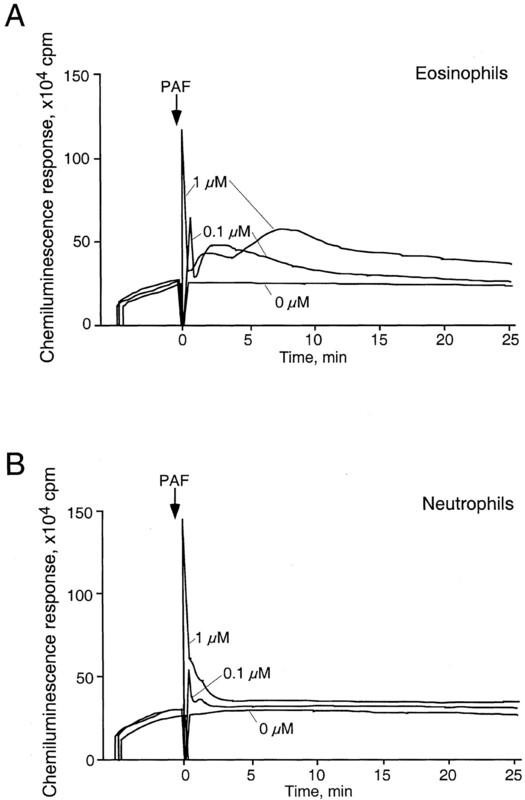 A large quantity of superoxide anion was produced during this second-phase response; this may explain why PAF triggers non-motility functions (e.g., respiratory burst, degranulation) differently in eosinophils and neutrophils, but these cells show similar chemotactic responses (11). Indeed, a concentration of wortmannin, which was sufficient to inhibit the second phase, but not the first phase, effectively inhibited the entire superoxide anion production, as measured by cytochrome c reduction (Fig. 8⇑), suggesting a critical role for the adhesion-dependent second-phase pathway in eosinophil effector functions. Perhaps the differences between neutrophils and eosinophils are physiologically important. Neutrophils are the most rapidly recruited leukocyte and are essential for phagocytosis and killing of bacteria, but can also damage host cells. In extreme instances, such as toxic shock syndrome and endotoxin shock, neutrophils kill the infected host. In contrast, eosinophils are largely localized in the mucosal tissues and recruited slowly to the sites of inflammation; they release their inflammatory mediators toward the targets to which they adhere (1). The different responses of neutrophils and eosinophils to chemotactic factors, such as PAF, may illustrate their specialization for functions and effector mechanisms in host defense and human diseases. Of interest are the upstream regulatory events enabling PAF to activate dual effector pathways in eosinophils, but limiting activation to virtually a single pathway in neutrophils. PAF binds to the leukocyte surface via a seven-transmembrane, G protein-coupled receptor (46, 47). G proteins involved in the chemotactic factor response are often PTX sensitive, but PAF seems to be extremely PTX resistant (29, 48). For example, the PAF receptor in COS cells interacts with PTX-resistant G proteins (possibly Gαq/11) (49). In contrast, studies characterizing the G protein(s) coupled to the PAF receptor in primary granulocytes have been controversial. For example, the PAF-induced [Ca2+]i response of guinea pig eosinophils was resistant to PTX (24), while the [Ca2+]i response of human eosinophils was sensitive (21, 26, 27). In human neutrophils the increased [Ca2+]i stimulated with PAF was not blocked by PTX (28). We now report that PAF stimulates both PTX-sensitive and -resistant pathways in human eosinophils (Fig. 9⇑). In similar analyses with neutrophils we found that the first-phase chemiluminescence response of neutrophils to PAF was resistant to PTX (Table I⇓), consistent with previous observations (28). Therefore, the coupling of the PAF receptor to G proteins may differ considerably among cell types and animal species. Furthermore, human neutrophils express PTX-sensitive Gαi2 and PTX-resistant Gαq/11 and Gα13, while human eosinophils express only Gαi2 and Gαq/11 (50), suggesting that the expression of G proteins varies between these granulocytes. In a rat basophilic cell line transfected with human PAF receptor, a single PAF receptor population may interact with multiple PTX-sensitive and -resistant G proteins to mediate its biological response (48). Our studies also suggest that the PAF receptor is coupled to at least two different classes of G proteins in human eosinophils (Fig. 9⇑). Therefore, to better understand the molecular mechanisms of PAF, it will become essential to identify all the G proteins directly coupled to the PAF receptor; this will be a challenging task in primary and terminally differentiated cells, such as eosinophils. Another question is whether eosinophils have multiple PAF receptors, some being coupled to PTX-sensitive G proteins and others to PTX-resistant G proteins. The differences in the threshold concentrations of PAF needed to induce the bimodal response (Figs. 2⇑ and 3⇑) suggest that eosinophils possess PAF receptors with at least two different biochemical characteristics. However, only one PAF receptor gene has been identified in humans. Therefore, a single PAF receptor may exist with two different biochemical characteristics, dependent on its activation status. Alternatively, a single PAF receptor may exist in two different locations, such as the cell surface membrane and an intracellular site (51) and may react differently to nearby ligands and signaling molecules. Recently, a new and exciting insight was provided by chemokine receptors (52); the simultaneous presence of CCL2 and CCL5 formed CCR2-CCR5 heterodimers with unique features, including a reduction in the threshold concentrations of chemokines required to induce PTX-resistant responses. Interestingly, this heterodimeric complex also promoted the specific recruitment of Gαq/11, which distinctly activated PI3K and preferentially activated cell adhesion. Finally, this heterodimeric complex was not internalized or desensitized. Thus, dimeric chemokine receptors may produce a completely unique set of signals and functions compared with the monomeric chemokine receptors (53). Therefore, in our study the prolonged second-phase superoxide anion response of eosinophils to PAF, which is readily activated, PTX resistant, and dependent on PI3K and cell adhesion, could be explained by PAF receptor dimers (Fig. 9⇑). The human PAF gene possesses two alternatively spliced 5′ noncoding exons that are under control of two distinct promoters (54), suggesting that the expression and distribution of the PAF receptor are differentially regulated by a dual-promotor system. Although more studies are needed to better understand the regulatory mechanisms of PAF receptors, their biochemical characteristics, and their coupling to downstream signaling molecules, these dual signaling mechanisms may provide additional flexibility and complexity in the eosinophils’ response to PAF. Elucidation of two distinct and separate signaling pathways in eosinophils is important to better understand the intensity and the broad range of biological responses to PAF. We thank Cheryl R. Adolphson for editorial assistance, and Debra D. Ward for secretarial help. ↵1 This work was supported by National Institutes of Health Grant R01AI34486 and the Mayo Foundation. ↵3 Abbreviations used in this paper; PAF, platelet-activating factor; [Ca2+]i, intracellular Ca2+ concentration; LTB4, leukotriene B4; MAPK, mitogen-activated protein kinase; MCLA, 2-methyl-6-(p-methoxyphenyl)-3,7-dihydroimidazo-[1,2-a]pyrazin-3-one; PI3K, phosphatidylinositol 3-kinase; PTX, pertussis toxin; SOD, superoxide dismutase. Kita, H., C. R. Adolphson, G. J. Gleich. 1998. Biology of eosinophils. E. Middleton, Jr, and C. E. Reed, Jr, and E. F. Ellis, Jr, and N. F. Adkinson, Jr, and J. W. Yunginger, Jr, and W. W. Busse, Jr, eds. Allergy: Principles and Practice 5th Ed.242 Mosby-Year Book, St. Louis. Nakano, M.. 1990. Determination of superoxide radical and singlet oxygen based on chemiluminescence of luciferin analog. L. Packer, Jr, and A. N. Glazer, Jr, eds. In Methods in Enzymology Vol. 186: 585-591. Academic Press, New York.